Wednesday November 25th 1903 I baked bread and got dinner. Mollie went home tonight. Will went to town in the afternoon and I went with him as far as home. They were getting ready for tomorrow. I did evening work and read some. Mrs Hill brought the clothes home. 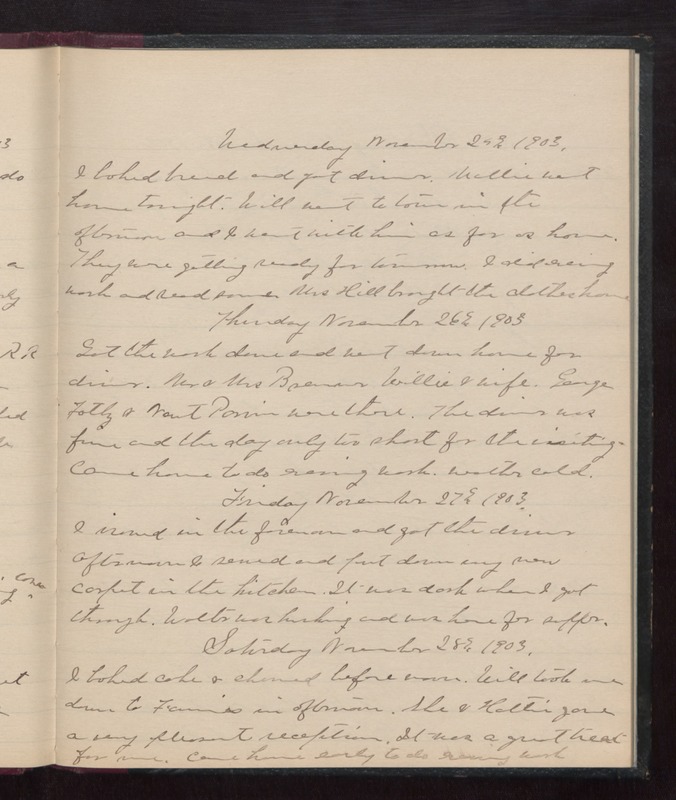 Thursday November 26th 1903 Got the work done and went down home for dinner. Mr & Mrs Bremner, Willie & wife, George Foltz & Newt [Pavin?] were there. The dinner was fine and the day only too short for the visiting. Came home to do evening work. weather cold. Friday November 27th 1893 I ironed in the forenoon and got the dinner. After I sewed and put down my new carpet in the kitchen. It was dark when I got through. Walter was husking and was here for supper. Saturday November 28th 1903 I baked cake and churned before noon. Will took me down to Fannies in afternoon. She & Hattie gave a very pleasant reception. It was a great treat for me. Came home early to do evening work.